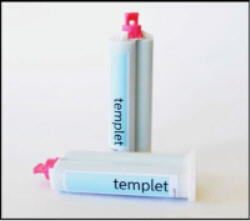 Templet™ is a polydimethylsiloxane impression material designed specifically to take multiple impressions in a short period of time, and achieve excellent details. No measuring or mixing needed. The material automatically mixes as it moves through the tip of the syringe. One cartridge will make 4-5 impressions. Made in Germany. Available in distinct turquoise color.